SWIFT stands for Society for Worldwide Inter-bank Financial Telecommunication, which is a cooperative non-profit organization, fully owned by its member banks. SWIFT code is used when the transfer between two banks happens internationally. It is an electronic message transfer system, that conveys messages in a pre-defined format, anywhere in the world as and when the transaction occurs. On the other hand, IFSC code is used when the fund transfers between banks take place within the geographical boundaries of India. It is an alphanumeric code, that recognizes the bank-branch taking part in the electronic fund transfer system. These two are the unique identification codes that need to be mentioned at the time of digital money transfer. There are notable differences between SWIFT code and IFSC code which are discussed in this article excerpt. Meaning A worldwide recognized identification code used at the time of international credit transfer between banks and also when there is an exchange of messages between banks is SWIFT code. A code that distinctively identifies a bank-branch involving in an electronic fund transfer system in India IFSC code. Applies to Only SWIFT enabled banks. All the bank branches in India. Found in Bank's website or the account statement. Bank-branch cheque book and RBI website. SWIFT is a short form for Society for Worldwide Interbank Financial Telecommunication Code. A unique identification code assigned to a specific bank to proceed money transfer between banks internationally. Moreover, the code is also used when there is an interchange of messages between banks. SWIFT code is allotted to the financial as well as the non-financial institution. The code is a combination of 8 or 11 alphanumeric characters. The details of the code are provided below. Indian Financial System Code is shortly known as IFSC code, which is a unique identification code used to accurately identify the bank branch engaged in the digital money transfer system such as National Electronic Fund Transfer (NEFT) and Real Time Gross Settlement (RTGS) within India. First four characters represent bank code. The 5th character is 0. Last six characters are branch code. All the bank branches within the country are assigned an IFSC code by the Central Bank of India. The code is used by the interbank fund transfer systems to proceed the message to the respective bank branch. 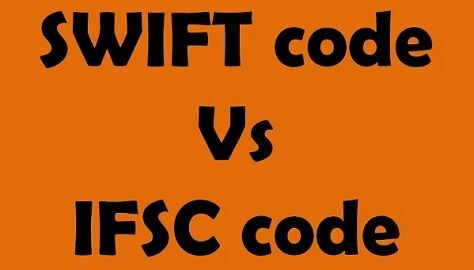 Key Differences Between SWIFT code and IFSC code. SWIFT code is a globally recognised code, used at the time of international credit transfer between banks and also when there is an exchange of messages between banks. IFSC Code is a unique identification code of a bank-branch used for the purpose of digital money transfer. The SWIFT code is approved by the International Organization for Standardization (ISO) Conversely; IFSC code is developed by Reserve Bank of India (RBI). Only those banks can take part in an international wire transfer, which is SWIFT code enabled. As opposed to, IFSC code is provided to all the Indian bank branches. The SWIFT code consists of 8 or 11 characters. Unlike IFSC code, that consists of 11 characters. In international money transfers (SWIFT code) the fees charged is higher as compared to national transfers (IFSC code). You can find SWIFT code on the bank’s website or the account statement while IFSC code can be found in Bank-branch chequebook and RBI website. The basic difference between these two codes is that SWIFT code is used when the transfer of funds between banks takes place internationally while IFSC code is used when there is a nationwide interbank fund transfer.